For the Jewish people, for some reason, it is different. Why is this people and this nation different from all other nations and peoples? Not every American is descended from George Washington, and most British people are not descended from Boadicea and her compatriots. The British monarchy is of German origin. President Sarkozy of France is not descended from Vercingetorix or his contemporaries. Barack Obama, running for President of the United States, is not a lineal descendant of either John Smith or Pocahontas or both. Nobody insists on pulling down the genes of every individual in every country to determine if their ancestors really belonged to their people. Yet for the Jews, it is different. A variety of "wise men" have decided that every Jew, must provide proof of descent from Abraham of Ur. Otherwise, it was claimed, the Jewish people have no title to the land of Israel whatever. Now this claim has been expanded. Professor Shlomo Zand claims that the Jews are not descendants of Abraham and King David. Therefore, he argues that there is no Jewish people, and no Jewish nation at all!2,3,4,5,6,7 His book is already an Israeli best seller in Hebrew, and will be published in French in September. Zand's claim can be summarized in a sentence. The "real" Jews of the land of Israel were killed or were converted to Islam and Christianity following the Roman conquest, and the Jews of today are "impostors." Contrary to Jewish tradition and Roman historical reports, no Jews were exiled from the land. All the Jews of Europe, including the Sephardic Jews of Spain, were converts, according to Zand. The Ashkenazi Jews were descendants of Khazars, he claims . That is hardly a new claim and one that is not supported by the latest genetic evidence (see "Are Jews Descended from Khazars?"). The Sephardic Jews, claims Zand, were converted "Berbers." Ironically, "Berber" is the racist name for the Amazigh and other native people of North Africa, conquered and suppressed by Arab imperialist colonialism. Zand's insistence on examining the descent of the Jewish people to determine their national status is based on several false assumptions. He asserts that the French, English and Germans only became peoples in the 19th century. Henry the VIII and Elizabeth I as well as William Shakespeare would likely have been astonished at this news, though "Britain" came into being somewhat later. They were perfectly aware of the Norman, Saxon, Danish, Pictish and other "blood in their ancestry, but that did not preclude forming a nation state. "Rule Britannia" was written in the 18th century and set to music in 1740.8 The Zionists, according to him, copied their blood myth from the Germans. But in the 1840s, when the first proto-Zionists wrote of return to Zion, the Greek model must have been foremost in their minds.9 Moses Hess, on the other hand, cites the Italian risorgimento. Except in a poetic sense, nobody ever believed that the Italians were all descended from ancient Romans. "My initial intention was to take certain kinds of modern historiographic materials and examine how they invented the 'figment' of the Jewish people"
As he began to gather the "evidence" to support his thesis, Zand convinced himself more and more of its truth. Zand's notion that modern Zionists "invented" the exile and the Jewish people seems to be accepted without question by both Tom Segev and Ofri Ilani who interviewed him in Ha'aretz and by Yossi Gurevich, who enthusiastically propagated his views in various journals3,4,5,6,7, though it requires one to posit that modern Zionists also invented most Jewish, Christian and Muslim writings about the history of the Jews produced in the last 1,800 years. Belief in the "myth" of Jewish origins in Zion are evident in the medieval poetry of Yehuda Halevi and the messianic movement of Shabetai Tzvi and myriad other sources. It was not Herzl in the nineteenth century who wrote, " How shall I render my vows and my bonds, while Zion still lies beneath the fetter of Edom, nd I am in the chains of Arabia?," and it was not written in Zand's beloved Yiddish. It was Yehuda Halevi, the Spanish Jewish poet, who wrote it in Hebrew, about 800 years before the supposed "invention" of the Jewish nation by Zionists. The Puritan movement supported the restoration of the Jews from its inception. Other branches of Christianity accepted the exile as fact, though they posited that it was punishment for rejection of Jesus as Messiah. If it is all a myth, then it is a shared delusion of all of western civilization. Zand would have us reject this "myth." On the other hand, he is evidently perfectly content to accept as solid scientific fact the Muslim contention that Muhamad flew on his horse to Jerusalem in a night, which is the basis of the Muslim claim to Jerusalem. When objective scientific drives policy. everyone benefits. When science is used to justify political dogma, or "scientific" research is directed to find an answer that suits politics, both science and mankind suffer. Supporters of the Palestinian cause ridicule the 19th century slogan adopted by the Zionists, "A land without a people for a people without a land." The Arabs of Palestine are still outraged over the dictum of Golda Meir, "There are no Palestinians." Tom Segev, who wrote a glowing review of Zand's book, would never surely never countenance the statement that there is no Palestinian Arab people. Nonetheless, Segev and other enthusiasts are willing to accept Zand's contention that there is no Jewish people. It is fair to ask, would the political views of these authors change, or should it change, if irrefutable evidence were found to support one or another contention regarding the exile? Or is it more likely that their contentions regarding the exile are based on their political views? The nature of science and historiography are such that there is no "irrefutable" evidence that would ever be accepted by all parties. It appears that in this case, Zand, Yuval and their followers did not like the history, so they invented a new one to suit their political ideas. 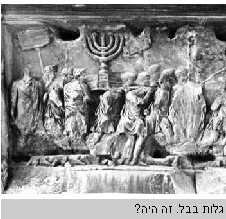 Detail from the arch of Titus in Rome from Gurevich7 with the Hebrew caption, "Galut Bavel, Zeh Haya" - "Babylonian Exile: Did it happen?" Enlarged detail from the Arch of Titus, which commemorates the triumph of Vespasianus and Titus over the Jews in 73 CE and the destruction of the second temple, and not the destruction first temple and Babylonian exile, half a millennium earlier. Josephus Flavius claims that Jewish captives were displayed in the triumph. The figures shown are clean shaven, unlike Jews, but are not wearing military dress. Josephus records nearly 100,000 captives, after the fall of Jerusalem alone. These were presumably sold in local slave markets in various parts of the Middle East. How many centuries would be required before these captives accounted for millions of Jews? Zand claims that the logistics of the time did not permit massive deportations. Likewise Zand insists that no Jew left Roman Palestine after the Bar Kochba revolt in 132-135, though they were forbidden to live in Jerusalem, and centers of Judaism moved to outlying districts. Rome abounded in slaves and gladiators and freedmen of every nationality in the empire: Greeks from Asia minor as well as those from Greece, Gauls from Asia minor, Gauls from Gaul, Africans, Syrians, Egyptians, Thracians, Britons, Germans, Goths, Arabs and Armenians. Thracians, Arabs and others came to be Roman emperors as well. Zand would have us believe that Jews alone were not transportable and did not leave their land for any reason. The theory that European Ashkenazi Jews are descendants of Khazar converts was popularized by Arthur Koestler13. Genetic similarities between male Jews and east Mediterranean populations, however, indicate that Jewish roots probably go back to the Middle East, rather than Central Asia.14,15,16 Studies of Kohanim, who claim descent from the family of the high priest, indicate a close genetic relationship between Kohanim of Jewish communities around the world. 17,18 Zand does not apparently examine genetic evidence to prove that Yemenite Jews are unrelated to Europeans. For him, it is sufficient that they have different customs. Zand bases his disenfranchisement of the Jews on an argument about descent. It is therefore bizarre that none of the reviews of Zand's book or interviews with him discuss any of the genetic evidence at all. Zand is a professor of French history and cinema, but surely either he or his interviewers must have heard of the growing genetic evidence regarding the origins of the Jews! Not surprisingly, those who insist on disinheriting the Jewish people have a ready answer should their racist genetic claims be refuted. They argue that studies that examine the genetic relatedness of Jews exemplify "Zionist elitist racism. "19 It would seem therefore, that if the Zandinistas have their way, the Jews are to be both disinherited and relieved of their right to self-determination, regardless of who their ancestors or relatives might be. The dispute, like the "debates" of the Middle Ages between priests and rabbis, has a predestined outcome: the Jews will lose. As Zand points out, studies by Belkind22 and Ben-Tzvi23 among others showed that the Arabs of the land of Israel, as they were then called, were in part descended from Jews. This might account in part for genetic similarities24 between Jews and Palestinian Arabs, provided that it is admitted that there was indeed a Jewish exile. This very same evidence is used by Tsvi Misinai25 to argue for the opposing political position: that Israeli Jews should seek to reintegrate Arab Palestinians into the Jewish people. It is improbable that all the Arabs of the land of Israel are descended from ancient Jews. Some of the Arabs living between the Jordan and the Mediterranean are descendants of Africans, and particularly of African slaves.26. Some of the Arabs were brought by the Turks in the late 19th century to repopulate Palestine.27 Some, as noted by Belkind 22 can trace their ancestry back to Jews, though those Jewish ancestors are often Sephardic Jews who came from Spain after the Spanish Inquisition -- the same Jews that Zand insists are "Berbers." Of the leading families of Palestine, the Nusseibeh family claims its ancestors came with Umar28; the Husseini family claims to have come with Saladin29; the Nashashibi are though to have come with the Mamelukes30; Dajani are a peninsular Arabian family that were awarded estates in Jerusalem in the 15th century.31 Among modern Palestinian Arab leaders, Izzedin al Qassam was Syrian, for example, and Fawzi al Qauqji was Lebanese. None of the above, however, is relevant to current political realities. Modern Zionism did not succeed because it invented a myth about Jewish origins and then convinced the rest of the world of its truth, while rewriting all of previous history to make the record conform to a political idea. Modern Zionism succeeded in part because the Jews and the Christian world, whether pro-Zionist or not, always believed that the Jews originated in the land of Israel, and because the Jews believed they are a nation. After all, modern Zionism did not invent the term am Yisrael, the people of Israel, and modern Zionism did not originate the vow, "next year in Jerusalem." What would constitute the basis for our existence here is not mythological historical right, but rather would be for us to start to establish an open society here of all Israeli citizens." Or, as others have said: "The ends, comrades, justify the means." In Zand's utopia, why would Jews have a greater right to live in Israel, than to emigrate en masse and claim some land in Iowa, and establish an open society of all Israeli citizens there? Or perhaps Arabs and Jews should move to the former Jewish autonomous region of Birobidjan, established by Stalin. Indeed, why would I or anyone else want to live in Israel if we were convinced that we are not members of a Jewish nation? Neither the majority of the Jews, nor the majority of the Arabs, see themselves as members of an Israeli nation or people, as Zand admits, and neither would want to live in such a society. For the same reason, the quaint notion of inviting Arabs to join the Jewish people would not have many takers. A recent public opinion survey indicates that a majority of the Arab Palestinian people living in Gaza and the West Bank do not want a "secular democratic state of all its citizens." They want a state governed by religion, and they believe that religion should be the source of law. They also believe that the people should be the source of law, and see no contradiction. 32. These ideas are totally alien to Zand thought. How could it be thought to be a democratic society if nobody supports it except the Zandinistas? What would be the official language of such a society? If the majority of such a society indeed voted for a republic based on religion, and on that basis voted to expel all Jews except those whose ancestors lived here before 1917, or to abridge the rights of Jews, as the Hamas would want, would it be democratic? Zand has created a new myth. Yiddish was spoken by orthodox traditional Jews of Eastern Europe in the framework of their rabbinically dominated ghetto society, which was hardly modern. The Yiddishist society that Zand apparently has in mind is either the secular culture of the enlightenment, which was often, in fact, based largely around Hebrew, or the artificial culture of the Jewish Bund which was created after the rise of Zionism and in reaction to it, and which was virtually annihilated by Stalin and Hitler. The latter had nothing in common with traditional Judaism. Yehuda Halevi, Ibn Gavirol and Maimonides, were not part of our people according to Zand, as they spoke no Yiddish. Zand thereby disinherits the Jews of Iraq and Persia and Spain and Yemen and North Africa. The most opinionated, racist and elitist Ashkenazy Mapai stalwart, the worst fictional stereotype that could be invented by the anti-Semitic enemies of Zionism, would never have dared to attempt such a feat! Rabbi Alkalai, a forerunner of the Zionist movement, a Sephardic Jew of Saloniki who spoke no Yiddish, has no place in Zand's concept of the Jewish people and no part in Israel. The Meyuhas family of Tiberias and Jerusalem originated in Spain. Its illustrious members aided Eliezer Ben Yehuda in reviving the Hebrew language, staffed the Palestine Post and performed many services for the Zionist movement and the state of Israel. Zand insists that they have no part in Israel and no place in Judah. Presumably, they were all "Berbers." They to be excluded from peoplehood along with Shoshana Damari, Yitzhak Navon, Shlomo Hillel and millions of others. That is Zand's utopia. In Zand's secular democratic promised land, Sephardic and Eastern Jews could have their place as Arabs, and the Ethiopians can go back to Africa, for they surely never spoke any Yiddish. The official language of the Yiddishistic nation and culture living under Zandism will be, presumably, Yiddish, to be adopted by Jews and Arabs alike. Sayed Kashua, the gifted Israeli-Arab comic, will presumably be enlisted to continue the tradition of Shalom Aleichem, in the original Yiddish. This is the rosy future for which we must give up the "myth" of the Jewish people. As with all such democratic utopias, we must all be voluntarily enthusiastic about the Zandinista future, whether we like it or not. Surprisingly, Zand does not recommend a single state between the Jordan and sea, which would be one logical outcome of his ideas. Secular democracy need only apply to Israel within the borders of the green line. The Arabs of Palestine will have a separate state where they are free to express their nationality according to whatever myths please them. Surprisingly too, Zand is afraid that his book will be translated into Arabic in an unauthorized version and "misinterpreted" as denying Jews (or we who pretend to be Jews) any rights in the land of Israel. He doesn't want to destroy Israel, he only wants to make it democratic.5 In the process, the Jews will be denied not only the right to self-determination, but even the right to claim peoplehood. Only the Arabs of the land of Israel will be able to form their own exclusivist Arab state. Presumably all the Yemenites, Sephardi "Berbers" Ethiopians and other Jews who are not privileged to be part of the Yiddishist culture and do not support the ideology of the Bund, will gravitate to this Arabic state and would be received by them with open arms, provided only that they accept the religion of the prophet. Zand should be more afraid of an authorized and correct translation. Given that Zand insists that the Jewish people is a lie invented by Zionists in the nineteenth century, or alternatively by compilers of the Babylonian Talmud, what other possible interpretation or implications can there be for his work, than that the so-called Jews should go back where they came from? Peoplehood is based on personal and collective identity, which is a function of personal choice, not genetics. If people believe myths or facts about flying horses, converted "Berbers," Joshua and the walls of Jericho or other myths, it is because they choose to believe them, as they reinforce their identity and the choices they have made, and not the other way round. Israeli democracy is problematic. The political systems of neighboring states are certainly no less problematic. Jewish criteria for deciding who is a Jew based on maternal inheritance and Israeli criteria that are based on a Jewish grandparent are equally arbitrary and capricious. However, the way to correct all these problems is not to erase 3,000 years of history or to deny the right of self determination to the Jewish people or the Arabs of Palestine. The secular democratic Zandinista Yiddishist state of all its citizens will put all its citizens in a miserable state. Injustices cannot be corrected by falsehoods and worse injustices. 2. Zand, Shlomo, Matai ve'eych humtza ha'am hayehudi?" ("When and How was the Jewish People Invented?") Resling, 2008 (Hebrew). 15. Behar, DM; Garrigan D, Kaplan ME, Mobasher Z, Rosengarten D, Karafet TM, Quintana-Murci L, Ostrer H, Skorecki K, Hammer MF (2004). "Contrasting patterns of Y chromosome variation in Ashkenazi Jewish and host non-Jewish European populations". Hum. Genet. 114: 354�365. PMID 14740294. 18. Thomas, MG; Skorecki K, Ben-Ami H, Parfitt T, Bradman N, Goldstein DB (1998). "Origins of Old Testament priests," Nature 394: 138-40. PMID 9671297. 22. Belkind, Israel, Arabs in the Land of Israel, Tel Aviv, Hermon Publishing, 1969. 23. Ben Tsvi, Yitshak, Uchlusyey Artzeinu (Populations of our land in Hebrew),, Warsaw: The Labor Committee of "Brit Hanoar" and the World HeHalutz Center, 1932. 25. Misinai, Tsvi, Brother shall not lift sword against Brother, Liad Publishing, 2008. 27. Avneri, Arieh (1984). The Claim of Dispossession: Jewish Land-settlement and the Arabs, 1878-1948. Transaction Publishers, London, 1984. 29. Rubinstein, Danny, A victory for the Hebronites, Haaretz, June 6, 2001.